You are here → Home → News & Events → Minor Girls win Division 2 Shield! 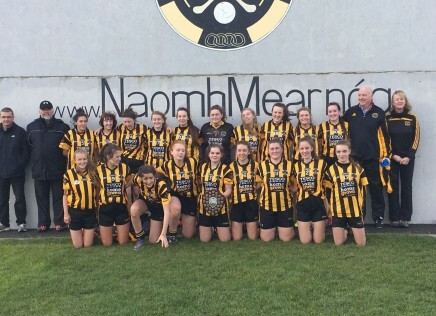 Minor Girls win Division 2 Shield! In a great display in windy conditions our minor girls recorded a great victory when they took control from the throw-in with some great attacking and resolute defending. Congratulations to all the players and management team of Anthony Brennan, Ciaran Griffin, Brendan Collins and Joan O’Connor. Sophie Brennan, Eimear Kenny, Amy Kavanagh, Ruby Smith, Emma Tuthill, Hannah Collins, Ella Griffin, Ciara Holland, Maria Kelly, Lauren Waters, Sarah Brennan, Claire McGowan, Ellen Daly, Lauren Delaney, Rebecca Cooke, Megan O’Connor, Tara Daly, Katie Flanagan, Niamh Browne.